So here are some quickies on the essence of time management. Don't sacrifice the important items for the urgent ones! 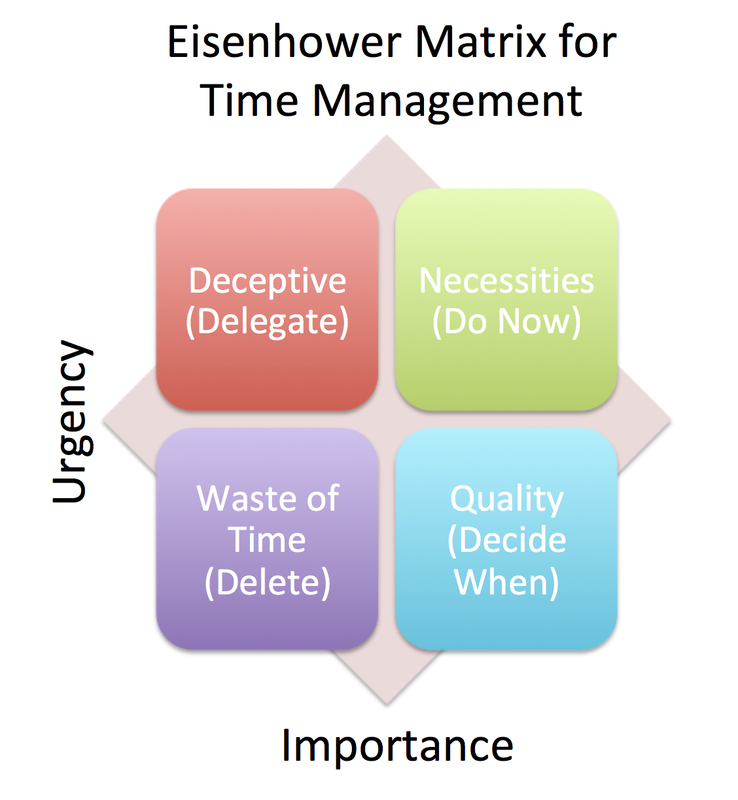 - Focus on the items that are important on the right side of the matrix--if they are urgent (upper-right), you need to do now; if they aren't urgent, but they are important (lower-right), you need to make time for them. 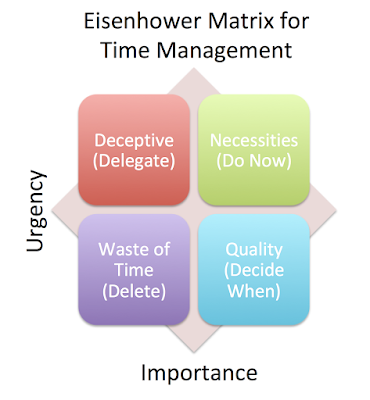 - Deemphasize the items that aren't important on the left side of the matrix--if they are urgent and not important (upper-left), limit them or delegate them; if they aren't urgent or important (lower-left), delete them. There are two potential areas of dissonance that can cause you tension, stress, and anxiety. - When the urgent top row items and the lower-left life necessities get in the way of your focusing on the quality life items that are of long-term importance to you (the lower-left). For example, work and errands can crowd out your personal, family, community, and spiritual time. - When you have too many items in the lower-right quality time area and these are in competition with each other for your time and attention, and you don't know how to prioritize them and get it all done. It's like there is never enough time. For example, we ignore our spouse, the kids, or closeness with G-d, because we just can't get to it all. This is where our personal values and conscience come into play to drive what we do and how we spend our precious time in this world. We all only have 24 hours in a day, so our actions need to be purposeful and driven by our values! Imagine another matrix with focus on tasks on the vertical access and focus on relationships on the horizontal access. Again here, we want to ensure a healthy balance of focus on both task and relationships (upper-right corner). If we focus on tasks at the expense of relationships or relationships at the expense of tasks, we are going to have a problem. Moreover, it makes no sense to focus on items that are neither task- nor relationship-focused (lower-left). We need to collaborate with others to accomplish great, complex tasks (we can only accomplish so much alone). Again, dissonance (tension, stress, anxiety) is caused when we are pulled off-balance to focus on work or people to the exclusion of the other. We've got to build meaningful relationships and work together to get the mission done and the mission can be helping people and building a better society in a variety of ways. In a sense, it's people helping people. Love thy neighbor to help thy neighbor.